← Superior Scaffold helps install innovative solar array over Camden County Wastewater Treatment Plant. Even the best laid plans get interrupted from time to time. So was the case at Thomas Jefferson University Hospital in Philadelphia, PA. The Alumni Hall building on the Jefferson University Hospital campus in Center City has been undergoing some changes to the HVAC system. Superior Scaffold was called out to install scaffolding on the 6th floor rooftop spanning the entire 42 foot long section of roof all the way up the the 9th floor so workers could get up to make piping tie-ins and add insulation. 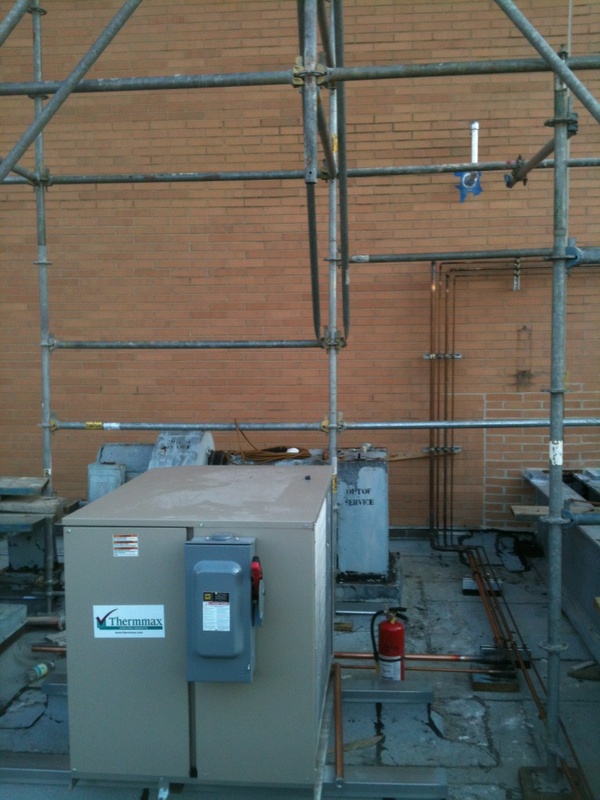 The scaffolding was in place and functioning well when one of the contractors determined that he needed to get directly beneath one of the supporting legs of the scaffolding to install a new rooftop HVAC unit. 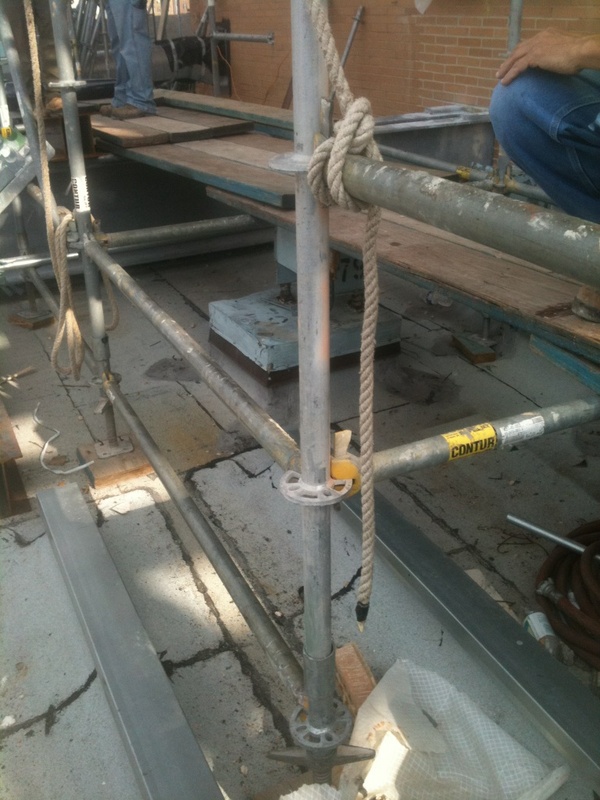 Normally, not a problem but this was directly in the middle of the already assembled and functioning scaffold – and to make matters worse – it was beneath one of the supporting legs. So the call went out to Superior’s 24 hour emergency services line and within hours they came up with a solution. See the reconfigured scaffolding below. You can see how the weight was redistributed to free up the room for the new unit to be installed beneath the scaffold while still allowing work to continue safely overhead. 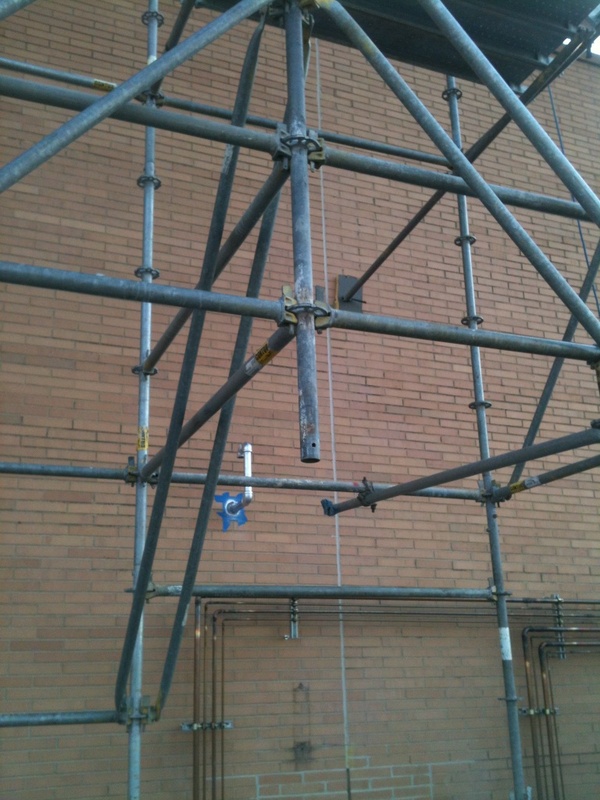 Who says you can’t adapt an already built system scaffold? 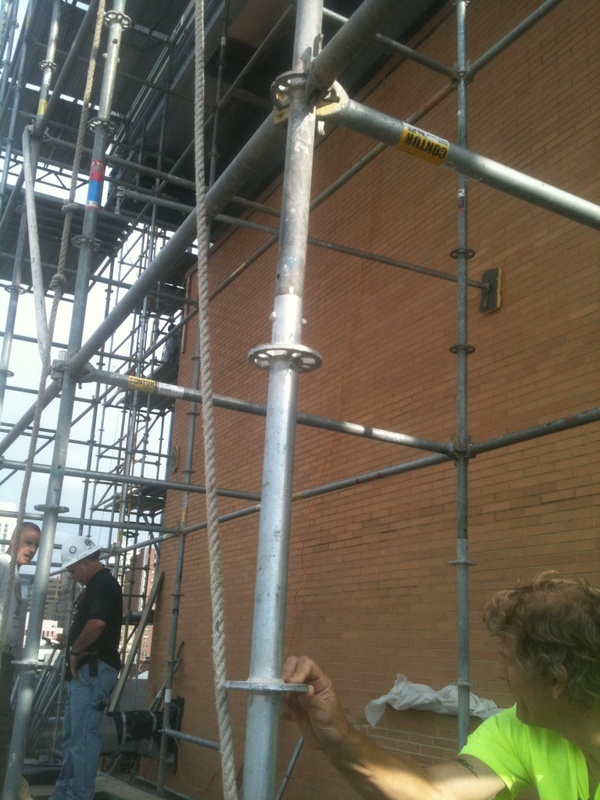 Superior Scaffold at (215) 743-2200 is the best at what they do. Posted on June 27, 2012, in News & Updates, System and tagged 215 743-2200, ABC, cbs, DE, Doctor, Education, facebook, Fox, frame, Hospital, Illness, Jersey, magazine, Marketing, MD, NBC, New Jersey, News, NJ, PA, philadelphia, Philly, Rental, sales, scaffold, scaffolding, Service, superiorscaffold.com, Suspended, Swing, System, the, twitter, youtube. Bookmark the permalink. Leave a comment.